iNTRODUCING THE NEW wine in A can, MADE FOR WOMEN, BY WOMEN. Cheers to women’s empowerment! We’re excited to welcome our newest Sisters, SHE CAN Wines, into the McBride Sisters Collection with a Sauvignon Blanc and Rosé! 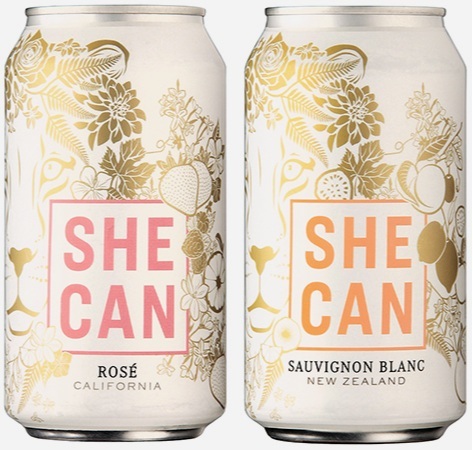 SHE CAN is our new wine in a can...made for women, by women. The best part? You can enjoy these wines where bottles can’t go–at the pool, at a sports game, on a hike, or at home as a convenient way to wind down after a long day. The SHE CAN line of wines reminds you that SHE CAN do anything. We focus on being environmentally conscious, and because aluminum cans are a lightweight material compared to glass, the carbon footprint to transport SHE CAN is substantially smaller. 2018 SHE CAN Rosé by the McBride Sisters is a sophisticated dry Rosé of 45% Pinot Noir, 32% Merlot, and 23% Zinfandel from the Central Coast of California. The refreshing flavors of white raspberry and orange and mandarin zests compliment the chalky earth notes. This is a serious Rosé ladies. 2018 SHE CAN Sauvignon Blanc by The McBride Sisters from Marlborough, New Zealand is a perfectly crisp, tropical refresher. You’ll love the carefully balanced notes of passion fruit, fresh kiwi, and white fig. Juicy citrus notes tie the flavors together and linger deliciously on the palate. We have created “The McBride Sisters SHE CAN Professional Development Fund” to promote the professional advancement of women in the wine industry. Through this fund, we will empower women to strive for change and to create opportunities for themselves where there hadn’t been before. Why? Well, while wine is no longer a boy’s club, it’s not a level playing field. Women make up less than 10% of head winemakers and winery owners. Let’s close the gap because we know SHE CAN! We’ve had an incredible amount of support over the years and we couldn’t be more grateful. We want to show our appreciation through scholarships ensuring that we continue to overcome gender biases within the industry. We’ll begin accepting applications for scholarships April 2019! Please check back here for more information. Give it up to Girl Power! We know SHE CAN and she will.